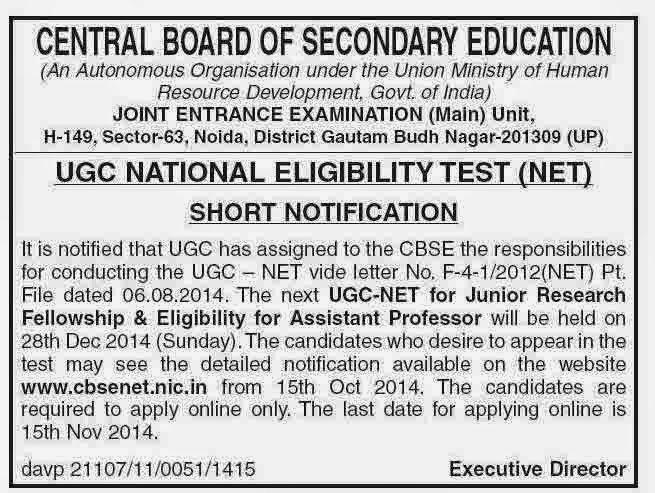 Central Board Secondary education CBSE, Joint entrance examination , Main unit , published the official Notification for UGC National eligibility NET December examination 2014. It is notification that UGC university grant commission has assign to the CBSE, the responsibilities for conducting the UGC NET December 2014 vide letter no. F-4-1/2012(ET) Pt. File dated 06.08.2014. The Next UGC NET for Junior Research fellowship JRD and eligibility for assistant professor will be held on 28 December 2014 . the candidates who wan to fill application for the UGC NET December 2014 are required to fill application form online at the official website cbse net. Online registration process will begin from 15 October 2014. all candidates are advised to fill application form online only . last date of online application form submission, and online registration is 15 November 2014.
all interested candidates can fill application form at the official website of CBSE NET.